What if historical video footage of UGA’s campus, sporting events and monumental moments were at risk to never be viewed again by the public? Did you know that an iconic sports moment – – the 1943 Rose Bowl [UGA versus UCLA], UGA’s only Rose Bowl win to date – – was almost lost due to its age? Shelves of film canisters are stored in a high density vault at UGA’s Special Collections Library waiting to be converted to a modern digital file format. Unfortunately, film preservation comes at a high cost and the industry is shrinking, becoming a lost skill. 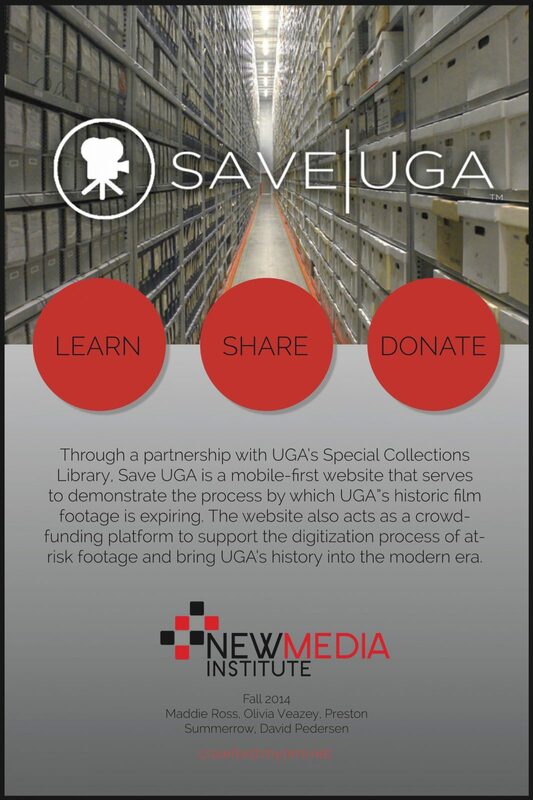 SaveUGA is a website dedicated to education and fundraising through a partnership with UGA’s Special Collections Library. It will serve to educate University students, alumni and Georgia enthusiasts about what’s at stake to be lost and the process by which this film footage is expiring. The website will also serve as a crowd-funding platform to fund the digitization of some at-risk footage and bring UGA’s history into the modern era. Fundraising efforts will be specifically targeted towards two different projects for digitization, creating a competition among supporters. Donors will be encouraged to share their contribution on social media and challenge fellow UGA fans to contribute as well. The quantity of film footage waiting to be preserved at the Special Collections Library is massive and the cost to preserve each piece can be overwhelmingly high. By focusing on two projects, each donation has purpose. If the fundraising goals are met, two pieces can be digitized, showcased online and be made available for donors to download. The New Media Capstone group SaveUGA had a major pivot in mid-October, changing partner clients, which completely changed the direction of the project. Originally the goal was to create engaging UGA-specific video content that students and alumni would subscribe to watch. The objective then changed from producing content to preserving content. While the entire project is no longer focused on video content creation, the educational videos on the website were uniquely produced by group members using a GoPro video camera nestled on a flying drone – how cool is that? The website was created using Bootstrap and has mobile responsive web design. Throughout the semester, the group has learned about video editing, social media integration and being flexible as a team.